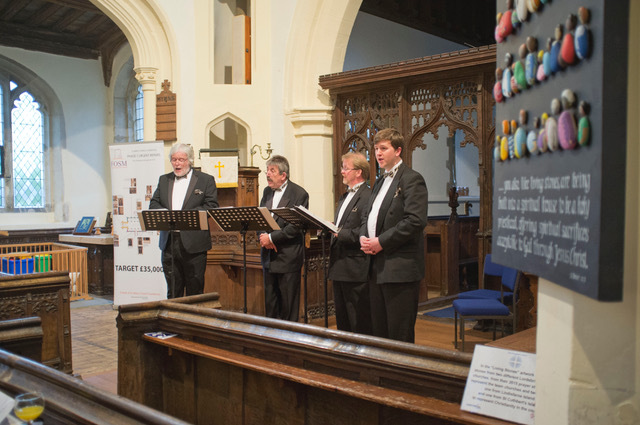 FOSM were lucky to get the multi-talented Song Cycle Quartet to help us raise money for the fabric of our Grade I listed building of St’ Mary’s Church. The Church resounded for over 90 minutes to divine and secular harmonies punctuated by fits of merriment from the audience. Arranged by our Treasurer, Richard Elleray, this concert brought in over 70 paying guests who enjoyed not only a number of (Gluten Free) nibbles and a couple of glasses of wine or fruit juice. Much more importantly for FOSM, the concert raised over £420 ! I didn’t think that I would enjoy it but I was amazed by what I heard. When are they coming back ?